A video published by the Guardian shows four policemen in Myanmar beating Rohingya villagers. Myanmar’s de-facto leader Aung San Suu Kyi has said the four officers have been detained and the incident will be investigated. According to the Guardian the government had organised a trip for ambassadors in Myanmar to visit the area after embassies requested access. Rohingya rights activists say residents were ordered not to complain. After years of persecution against the Muslim minority in Buddhist Myanmar this is hardly an adequate response. Perhaps the Nobel Peace Laureate is finally trying to face up to international pressure. Suu Kyi has long been considered a human rights icon herself, living under house arrest for 15 years after giving up life with her husband and children in the UK in order to not abandon her own people. But last week more than a dozen fellow Nobel laureates publicly condemned her government’s current crackdown on ethnic Rohingya, warning of the possibility of committing ethnic cleansing and crimes against humanity. 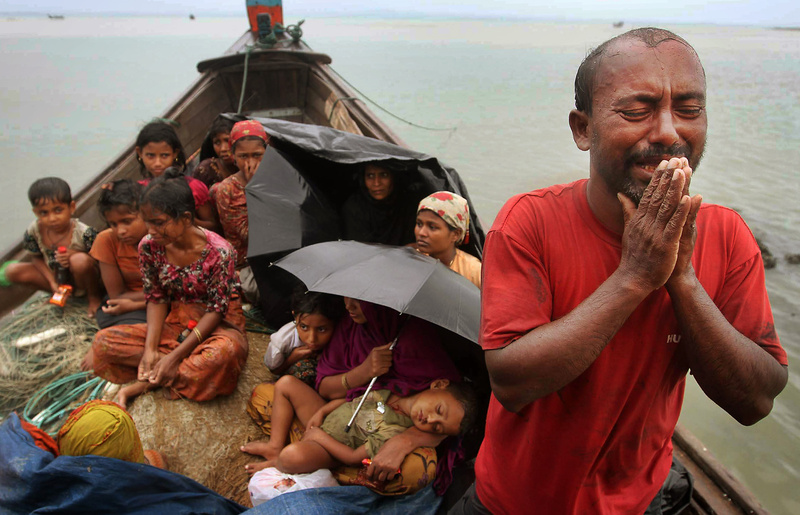 Thousands of Rohingya continue to flee to Bangladesh. During bloody clashes in 2012 more than 100,000 ended up in squalid camps. More than 50,000 others have fled since October last year.